This weekend saw the start of the Belgian ’cross season. Although there have been races before this point, none of them have been at UCI level or in a major series. Down at the bottom of Flanders near Kortrijk was the Brico Cross on the famous Muur de Geraardsbergen. On paper, this looked like a fantastic course, not just for me but for the spectators. I mean who wouldn’t want to race on the famous Muur, finishing at the iconic Chapel on the cobbles? 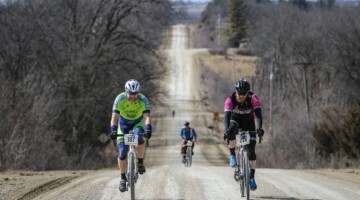 Having gone to the course to pre-ride on Saturday, I can confirm it was a great course in practice too, with a field section, a wooded section, a steep descent and half of the famous hill. The ride on the course the day before the first event of the season is also to remember what bike racing was all about and remember that feeling of being between the barriers. It was a pretty tough course, especially with the cobbled uphill after the descent, this race was always going to be a story of survival. With a few tweaks the potential for this race is huge. It could easily become a classic of the likes of Koppenberg and Gavere. Yeah, it would need to be in November as September weather is erm … well … let’s be honest, still summer! Here starts my campaign for ’cross to start after Road Worlds has already taken place. I’ll get an online sign-up area sorted soon. Anyway, skip forward to race day and as you may have heard me say on my CX diaries and probably read on social media, there was a controversial decision made on race day about the course. 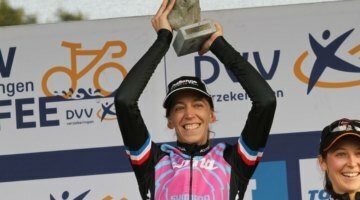 The commisaires, on receiving complaints from riders in the race of the descent being dangerous, removed it from the race for the Elite Women and Juniors. They also proceeded to move the actual route for the U23 and Elite Men, making it sharper but with a less dodgy exit (in their opinion). I’m going to share my personal opinion on this and if you want to skip it stop reading now, but I really think it’s important to think through this decision made by everyone involved on the day. Firstly, race organizers claimed it was removed due to complaints from the female racers. Not a single rider I spoke to was happy about the decision. In fact, some were hugely disappointed as they were excited about such a techy aspect of the course that they could ride and others couldn’t. Now, this is going to sound harsh but I will say it anyway, do we at the very top of the sport cater for the very top of the sport or do we cater for the riders who aren’t there yet? Do we set the boundaries high so the riders have to raise their game to continuously build our reputation at the very top of the sport, or do we keep status quo so the gap isn’t so obvious? Could you imagine the commisaires taking out the descent for the men as there was one guy who had to run it? Secondly and the only point that can not be argued, the UCI this summer created a new rule stating that the course shall remain the same for Elite Men and Elite Women. 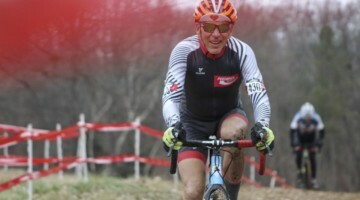 I have sat on those ’cross commission meetings for four years where I know every decision and rule change is heavily discussed amongst all stakeholders from riders through to race organizers and course inspectors. Despite what some might think, it’s not like they sit there drinking coffee chatting about what they did on their weekends. Think about this, when time and effort are put into making rules to help create an equal sport only for the very first Belgian race of the season to break the rule, what is the point of the rules? How can we ever get out of the mentality that “those precious little things” can’t possibly ride that? My third point is it’s the same for everyone. Yes, I did see riders, both male and female ride it, and yes I did see riders both male and female crash on it. As far as I’m aware the only person who hurt themselves was a U23 male rider, so surely, based on this, it wasn’t safe for U23’s too, not just the women? An obstacle in ’cross is an obstacle for everyone to work out the very best way for them to get through that section of the course irrespective of gender. Very few women regularly jump the barriers, they don’t take them out just because some of us can’t do it? Was the obstacle dangerous? In my opinion, based on the dryness and the deep soft ground at your run off, yes probably. Could you run it if riding it wasn’t in your skill set? Yes, although a few seconds slower, it was totally runnable. 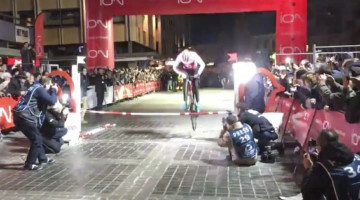 Should that kind of descent be in a ’cross race in the first place? Well if it was in November, with a bit of water holding the ground together and making the top surface more grippy, sure. In September in dust, yeah maybe not. Finally, when you take out the descent you also take out a huge amount of altitude gain. Suddenly the course turns from a wearing, hilly parcours into a race at the top of the Muur. I am not saying it would have made any difference to who won the race (Eva was on incredible form off the back of the MTB world championships the previous week). The course matched everything she was good at and she was one of those riders who I did see ride the descent well, so it wouldn’t have changed a thing. However, sometimes it’s important to really think about the repercussions of these kinds of decisions. At the first race of the season, no one wants to crash and hurt themselves, lose the money they spent on flights to the USA the following day or just generally make the sport look bad. In my personal opinion, I do understand they have a tough job and are just humans who feel they are making the right choices for everyone, however, I do believe it was the wrong choice made by the commisaires on the day. As with every time a race runs under 40 minutes it makes me annoyed, so does this. It seems with every step forward we make in women’s ’cross we are held back by others or if there is truth in what was said we even sabotage ourselves. 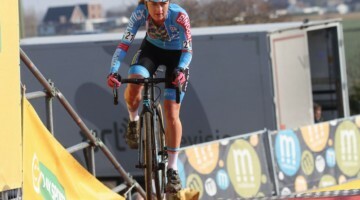 Luckily this week I saw an advert for a cycling museum in Belgium with a young girl, with mud on her face, riding her bike on cobbles and the words “Clear for the new generation of world champion.” The same day I saw there are now three cyclocross leagues in the UK who now have a women-only race, in local leagues, with over 50 riders in each league. I’ve been in this sport a really long time now and have seen such massive changes it’s indescribable. I have also, every single year, seen things like this that just put another chink in my armour. I will never give up on this sport I love, and the day I can no longer compete with the new generation of riders rising to the top of the sport is the day I will be crazy proud of how far we have come in my career. So please, please, please let’s just try following the rules with patience and see how that works out for us. See you in the USA. That was awesome, Helen. Great to hear your perspective on the whole issue.